It is always the case for digital food catering business to set up a fixed menu to make a seamless end-to-end process from food preparation to delivery. But Kinkao, a B2B food delivery to companies, offers a different touch to a set system. “We simply believe that companies need to have perks to make their company attractive, and we created the tools to support this. We want employees to have more benefits, especially those belonging to millennials group. Benefits in the form of food can really help,” says co-founder Samuel Coizet, who started the company with his wife, Pakki Coizet. Derived from that notion, the company developed a concept in which companies can custom order their catering menu. Instead of one type of meal for all employees, they enable a different meal for each person at the company. “That way, the ultimate experience of enjoying food doesn’t depend on the HR choice of menu,” says Samuel Coizet. So far, the Bangkok-based company has served over 60 companies including well-known startups such as Pomelo, aCommerce, and Shopee. Their approach has found a good amount of customers in the startup scene of Thailand. On its website, the introduction to the branding stated that Kinkao seeks to “drive productivity, increase collaboration, and company culture” through food. The way the company’s approach to food as a medium that brings people together, and as a rewarding perk, is probably why it has received positive feedback. Kinkao connected home cooks and local restaurants with companies through custom catering. In doing so, the company provides an option for budget adjustment. “To start the catering service, the company must register on the platform. Then, Kinkao will ask the company to put in their allocated budget for food and how many times per week they wish to have a catered food for the whole office. Our starting price is extremely low, in which the company is allowed to allocate THB15 (US$0.46) per employee per day. The company can order catering service as often as one day per week,” explains Pakki Coizet. To be able to cater everyone’s different choice of food within one company’s order, Kinkao will follow through LINE as the communication app. “We build a customised LINE allowing our users to get the next day menu that they can choose from. They can choose from the selection until midnight the day before the food production and delivery. Then, the ordered food will be delivered with the name of the person and what department the person belongs to,” she says. How would they ensure the quality of the food in large order? “We tested everything before we took it as one of the available menus to order from. We help them achieve our standard packaging, with the amount of food served a minimum of 300 grams. This way, we get to control the food quality,” she adds. The food testing is, in fact, part of the company’s quality control move. With delivering freshly cooked food as the service, it is easy to fall flat and skip the process to make things faster and easier. In addition to delivering, Kinkao also taste all the food on the menu. “We need to check on every aspect of the food, such as whether the ingredients the cook used to make the food has a short period of room temperature life, as catering food tends to sit for a while before being eaten,” explains Pakki Coizet. The company has made it their mission to specialise in large orders that satisfy everyone’s tastes and preferences. With other competitions offering only food catering and delivery for their customers, Kinkao stood out with the option to have food choice personalised and put it in the company’s tab. This allows customers to order individual choices that are restricted by religion or certain lifestyle, such as halal or vegan food. For the next innovation, the company that has been operating for only a year-and-a-half is optimistic about implementing the same concept for snack order and delivery. The product would be something that most people need and will enjoy, but hardly ever thought about. By bringing snack options to the office, Kinkao seeks to cater casual parties, regular office meeting, and even coffee breaks for 10 to 20 people. Given that so far they have sold over 250,000 boxes of meals, snack would be a clever breeze to further entertain employees with food. The two co-founders of Kinkao met when they both worked for Groupon, and both brought their expertise and learnings from the company. “During my time there, my work required me to meet with a lot of vendors that are always on the lookout for more business opportunity. I thought to myself: ‘How can I buy more of their products with better price and sell them under a platform?’ and we began Kinkao,” says Samuel Coizet. “Why food? It is our passion,” Pakki Coizet adds. The company is looking at a potential seed funding by the end of this year with the target to sell 10,000 boxes per day form 1,000 per day now. 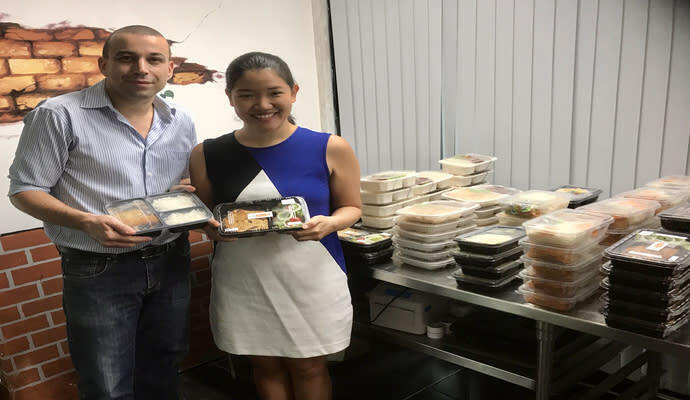 Once the seed funding is infused, their immediate plan is to build more technology to prepare for their expansion to Singapore and Hong Kong, two countries which they said have warmed up to Kinkao’s idea of catering. The post Kinkao wants to change the way companies order catering by making it an experience appeared first on e27.